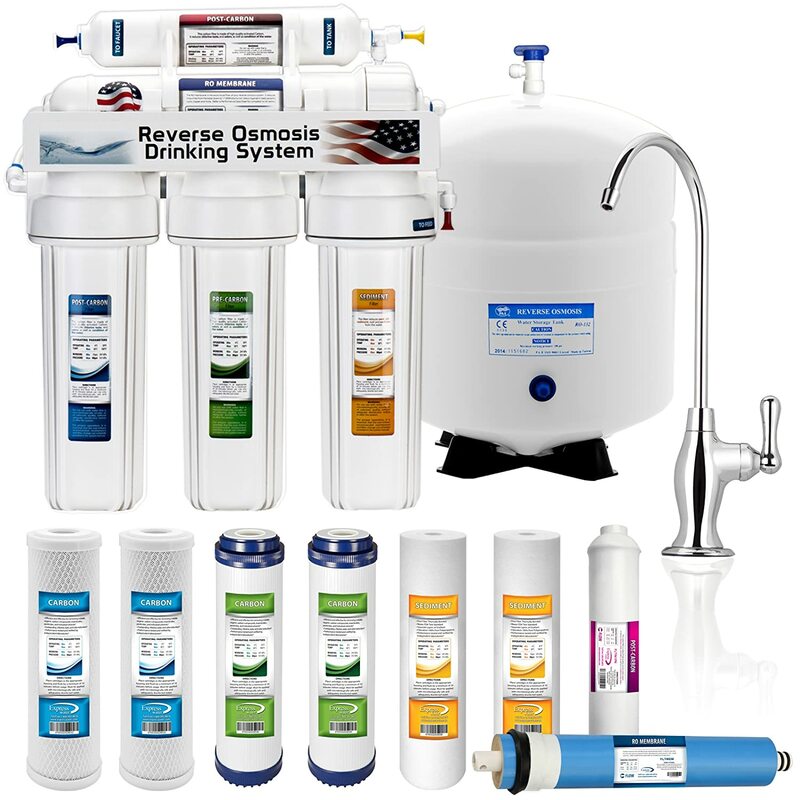 The 5 Stage Home Drinking Reverse Osmosis System PLUS Extra Full Set – 4 Water Filter is one of those filtration systems that gives us good tasting and healthy water. It’s considered as one of the best filtration systems because it’s not only cheap and economical, but it’s also very efficient at making healthy drinkable water. Water is very important in our world. Not only does it make our world cleaner to look at, but it’s what also keeps us all alive and running. Having clean water that’s drinkable and healthy all at the same time can be hard to attain. Now that there’s a lot of water filtration system out there in the market, it can be tough to distinguish what works and what doesn’t. There are systems that take away contaminants, but not all the harmful chemicals. There are some that removes all the contaminants, but also takes away the nutritional minerals that our body needs. Fortunately, marketers have invented now a new system that removes contaminants and retains the good minerals. 1st stage: 5 Micron Melt-down Polypropylene Sediment – it removes both large and fine particles. 2nd stage: GAC Activated Carbon Filters – it removes the chlorine in the water, plus the tastes and odors of the other contaminants. 3rd stage: 5 Micron Carbon Filters – it’s made from fine coconut shell carbon that blocks away carbon fibers like chlorine, VOCs, odors and tastes of other chemicals. 4th stage: Thin Film Membrane RO Membrane – the TFC Membrane removes the 99% of the water’s bacteria, viruses and other chemicals. 5th stage: Inline Granular Carbon Filter – it’s known as the polishing filters when it stabilizes the water for the quality and removes the other bad chemicals. You can use the water from this system for many purposes. You can use it for the drinking water of your family, making ice, coffee, tea, cleaning your house, gardening and many other things that you can think of. It can purify almost 50 gallons of water per day. It has a waste ratio of 1:3 and has a minimum rejection rate of 95% of TDS. It’s a well and solid construction that operates noise-free. This system is very easy to install and maintain at the same time. It shuts off automatically when the tank pressure gets up to 65% of incoming line pressure. The 5 Stage Home Drinking Reverse Osmosis System PLUS Extra Full Set – 4 Water Filter requires no electricity for the filtration system to work, it only uses the water it filters to purify it from its contaminants. The steel of the storage tank is NSF certified and it has a qualified calibrated flow restrictor. It only requires low maintenance when changing its filter cartridges of 6 to 12 months. It should only be used on biologically safe water supply like tap water that’s already been filtered by the city’s water supply. Even if have included the waste ratio in the advantages, it’s still a high percentage when it has 1:3 ratio. Therefore, we also have included this here so that you’ll know that it still put many water into waste. The 5 Stage Home Drinking Reverse Osmosis System PLUS Extra Full Set – 4 Water Filter has been created with expert standards from the manufacturers of APEC ROES-50 to give top quality, clean drinking water that’s refreshing with a crisp and natural taste. You can be rest assured that this product will filter your water quietly and efficiently. You don’t need to worry that your house will be flooded if you leave the system on when you leave because it shuts off automatically when the water tank gets up to 2/3 of the system.